One of my favorite set of posts from last offseason was the conference recap using SDPI. SDPI is a statistic I borrowed from Eddie Epstein that he used in his book, Dominance, to rank pro football's all-time greatest teams. SDPI stands for Standard Deviation Power Index and looks at how teams performed relative to the league average (or conference average in this case) and standard deviation in terms of points scored and allowed. The more standard deviations a team is above the mean, the better they are, and vice-versa. Here is the link to last year's Pac-10 post. As you can see, SDPI was a useful tool in predicting some of the rise and fall among the Pac-10's teams. In the interest of providing an even better offseason analysis, I will now be conducting another SDPI, this time for yardage. It is calculated in the same manner as the SDPI for points, but will obviously be measured against the conference mean and standard deviation for yards. Think of it this way: Points are the end result and yards are the means to that end. Thus, looking at both sets of data, we can get an even better idea about which teams are likely to improve or regress in 2008. If you want the meat of the article, skip this next paragraph as it just gives an example of how the SDPI is calculated. The mean points scored and allowed for all Pac-10 teams in conference play was 240.6 points. The standard deviation for points scored was 43.80. The standard deviation for points allowed was 51.13. Arizona scored 257 points in Pac-10 play and allowed 249. Their offensive SDPI was 0.37 = ([257-240.6]/43.80). Their defensive SDPI was -0.16 = ([240.6-249]/51.13). Their total SDPI for points (SDPIP) was 0.21 which ranked 6th in the conference. The mean yardage for and against for all Pac-10 teams in conference play was 3435.9 yards. The standard deviation for yardage for was 376.58. The standard deviation for yards allowed was 578.27. Arizona gained 3393 yards in conference play and allowed 3410. Their offensive SDPI was -0.11 = ([3393-3435.9]/376.58). Their defensive SDPI was 0.04 = ([3435.9-3410]/578.27). Their total SDPI for yards (SDPIY) was -0.07 which ranked 7th in the conference. 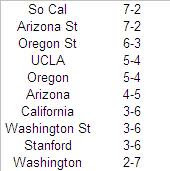 To refresh your memory, here are the 2007 Pac-10 Standings. Now here are the 2007 SDPI standings. Points wise, SDPI conforms pretty well with how things shook out. However, there certainly are some surprises when we look at yardage. For starters, Washington State and California, winners of only 1/3 of their Pac-10 games in 2007, rank ahead of Arizona State, the league's co-champ. How can this be? The Sun Devils began the season 7-0 and their only blemishes in conference play were to the league's top two teams; Southern Cal and Oregon (with Dennis Dixon). As is often the case, the simple answer is turnover margin. The Sun Devils led the Pac-10 with a +7 turnover margin in conference play. On the other hand, Washington State and California finished at the bottom of the league with a -4 and -6 margin respectively. The yardage differential also fleshes out just how bad Stanford was, relative to the rest of the league. Despite finishing a game ahead of Washington, tied with Washington State and California for 7th place, the Cardinal had both the worst offense and defense in the league. The Ducks still ranked as the best offense in the Pac-10 despite the absence of Dennis Dixon for the last 2 and 3/4 games. In the 6 Pac-10 games Dixon started and finished, the Ducks averaged 506 yards per game. In the 3 he did not finish, they averaged 317 yards per game. Stanford gained the fewest yards and scored the fewest points. They averaged 146 fewer yards and 17 fewer points per game than the top-ranked offense in Eugene. Only two Pac-10 teams gained over 300 yards against the Trojans--Oregon and California. At this point, it really is take your pick. They were both horrible. If there is one thing this blog does, its go out on a limb. The underdog Trojans have a shot at the Pac-10 title if things break their way. Who are we kidding? The Trojans have 3 co-championships and 3 out-right titles the past 6 seasons. If you're bad at math, that means they have earned at least a share of the last 6 Pac-10 championships. All signs point to lucky number 7 in 2008. If you're curious, Jeff Tedford did not forget how to coach in 2007. The Bears suffered through easily the worst season of the Tedford era in 2007. However, if we look at their yardage differential (a pretty good indicator of down to down success), the Golden Bears were about the 4th best team in the conference. Their undoing in 2007 was their proclivity to turn the football over. Their turnover margin of -6 was the worst in Pac-10 play. In their first two conference games, they defeated Arizona and Oregon and had a turnover margin of +6. In their last 7 conference games, they won only once and, not surprisingly, lost the turnover battle in each game (-12 in that span). Expect the Bears to migrate toward the middle of the league in turnover margin and jump a few spots in the standings as well. Based on the yardage incarnation of SDPI, the Cougars were one of the better teams in the Pac-10. Behind the efficient passing of quarterback Alex Brink, the Cougars finished behind only Oregon in yards gained in Pac-10 play. Unfortunately, their defense betrayed them. Only Washington and Stanford allowed more yards in conference play. Despite losing Brink to graduation, the Cougars could make a push at a bowl bid in the uber-competitive Pac-10 thanks to a few factors. 1. Their turnover margin of -4 was second to last in the Pac-10. Turnovers and turnover margins are highly variable, so its highly likely the Cougars will be more fortuitous in this department next season. 2. The defense, by all rights pretty bad last season, does get 8 starters back including the two leading sackers, Andy Mattingly and Greg Trent (both linebackers). 3. Brink is gone as well as one starting receiver and tight end, but the leading receiver, Brandon Gibson, is back for his senior season. The two leading rushers, Dwight Tardy and Christopher Ivory, both return. Plus the starting quarterback (Gary Rogers), while he lacks experience, is a senior. 4. The new head coach, Paul Wulff has been reasonably successful at IAA Eastern Washington. Wulff's teams have posted winning records in 7 of his 8 seasons and made the playoffs 3 of the last 4 seasons. 5. The Cougars' luck just has to change. The above table lists the yardage each Pac-10 has accumulated and allowed the past 3 seasons. The Cougars have basically played their opponents even over the past 3 seasons, as they have been outgained by 2 yards over 26 games. Unfortunately, that has not correlated to any success in the won/loss department as the Cougars have fared better than only Stanford over that span. If only they had the good fortune of the Bruins. UCLA has been outgained on the year each season, yet has finished no worse than 5-4 in Pac-10 play and actually boasts the second best conference record over that span. Before we leave the Cougars, I feel the need to tout the accomplishments of departing signal caller Alex Brink. Brink will never be as revered as his predecessors in Pullman, Drew Bledsoe, Ryan Leaf, and Jason Gesser, because he never led the Cougars to a bowl game. However, Brink has been an outstanding quarterback and his accomplishments should not be forgotten because his teammates were not as good. Dennis Erickson's first season in Tempe was a great success, resulting in a Pac-10 co-championship. Unfortunately, his encore performance will not be quite as good. For starters, the Sun Devils performance placed them around the middle of the pack in the Pac-10. They were 3-0 in one-score conference games, so instead of evaluating them as a 7-2 conference champ, it would probably be more prudent to consider them a 6-3 or 5-4 mid-level Pac-10 team heading into 2008. The Sun Devils should also see some regression in their turnover margin. The Sun Devils led the Pac-10 with a +7 margin in conference play. Should that number come down, which it likely will, the Sun Devils record will follow suit. Finally, thanks to the Pac-10's 9-game conference slate, the Sun Devils must play more than half of their conference games on the road. After beginning the season 2-4 (0-2 in Pac-10 play), the Beavers won 7 of their last 8 games, losing only to the Trojans. However, their margin of error was razor thin. They parlayed an excellent defense, second to the Trojans in yards allowed in conference play, a good turnover margin, tied for second at +5, and a little luck, 3-0 in one-score conference games, into a 6-3 conference record. With such great success on defense, why did the Beavers fail to win the conference crown? Because the offense was just plain bad. They finished 8th in the league in yards gained. Neither sophomore quarterback, Sean Canfield or Lyle Moevao, was able to throw more touchdowns than interceptions, compete 60% of their passes, or average over 6 yards per pass. In 2008, the Beavers can expect their turnover margin and general good fortune to regress. Thus, they need improved quarterback play, especially with the loss of senior running back Yvenson Bernard. However, even if they get that, the defense loses a ton of talent and will probably not be as strong next season. The Beavers main strength on defense in 2007 was tackling opposing ball carriers in the backfield (6th in the nation), and more specifically, generating sacks (10th in the nation). Of the 6 gentlemen with 10 or more tackles for loss, 4 are gone. Only defensive linemen Victor Butler and Slade Norris remain. The Beavers will have a tougher time getting into the backfield in 2008, and this will not be offset by enough improvement from the offense. One of my favorite set of posts from last offseason was the conference recap using SDPI. SDPI is a statistic I borrowed from Eddie Epstein that he used in his book, Dominance, to rank pro football's all-time greatest teams. SDPI stands for Standard Deviation Power Index and looks at how teams performed relative to the league average (or conference average in this case) and standard deviation in terms of points scored and allowed. The more standard deviations a team is above the mean, the better they are, and vice-versa. Here is the link to last year's Big 12 post. 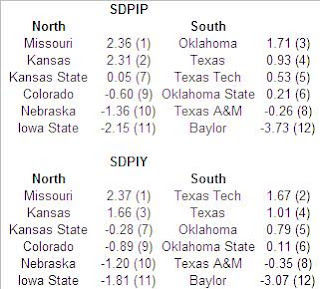 As you can see, SDPI was a useful tool in predicting some of the rise and fall among the Big 12's teams. In the interest of providing an even better offseason analysis, I will now be conducting another SDPI, this time for yardage. It is calculated in the same manner as the SDPI for points, but will obviously be measured against the conference mean and standard deviation for yards. Think of it this way: Points are the end result and yards are the means to that end. Thus, looking at both sets of data, we can get an even better idea about which teams are likely to improve or regress in 2008. If you want the meat of the article, skip this next paragraph as it just gives an example of how the SDPI is calculated. The mean points scored and allowed for all Big 12 teams in conference play (championship game not included) was 249.33 points. The standard deviation for points scored was 69.14. The standard deviation for points allowed was 60.98. Colorado scored 238 points in Big 12 play and allowed 276. Their offensive SDPI was -0.16 = ([238-249.33]/69.14). Their defensive SDPI was -0.44 = ([249.33-276]/60.98). Their total SDPI for points (SDPIP) was -0.60 which ranked 9th in the conference. The mean yardage for and against for all Big 12 teams in conference play (championship game not included) was 3429.33 yards. The standard deviation for yardage for was 524.93. 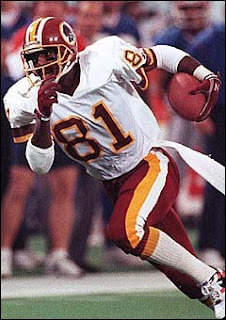 The standard deviation for yards allowed was 411.71. Colorado gained 3077 yards in conference play and allowed 3520. Their offensive SDPI was -0.67 = ([3077-3429.33]/524.93). Their defensive SDPI was -0.22 = ([3429.33-3520]/411.77). Their total SDPI for yards (SDPIY) was -0.89 which ranked 9th in the conference. To refresh your memory, here are the 2007 Big 12 Standings. Now here are the 2007 SDPI standings with conference rank in parentheses. There's not a great deal of difference between the actual standings and either of the SDPI measures. Most teams were within a place or two of where SDPI thought they should be. The two slight exceptions are Oklahoma and Texas Tech. In regards to SDPIP, both finished about where they should have, but in terms of SDPIY, they were a little off. We'll begin with a look at the Sooners. Despite winning the conference, the Sooners are only seen as about the 5th best team by the yardage incarnation of SDPI. If you read my Fiesta Bowl preview, you'll know why. The dynamic and ballyhooed Sooner offense, led by freshman quarterback Sam Bradford, was actually below average in Big 12 play. The Sooners finished 9th in the Big 12 in yards gained, ahead of only Colorado, Baylor, and Iowa State. In Big 12 play, they gained 405 yards per game. If we look at all games, the Sooners finished 19th in the country by gaining 449 yards per game. That number is inflated by non-conference contests against North Texas (668 yards), Utah State (617 yards), and Tulsa (553 yards). 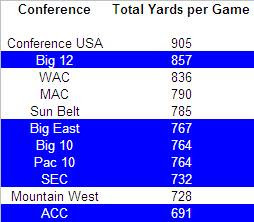 The Big 12 was also very conducive to offense in 2007, as 7 teams finished in the top 20 nationally in yards per game. Here are the conference-by-conference breakdown of total yards conference game. As you can see, the Big 12 was the second most offensively proficient conference in 2007, as the average Big 12 game saw roughly 857 combined yards. It was easily the most proficient of the BCS conferences as the second most prolific BCS conference, the Big East, saw roughly 90 fewer yards per conference game. Moving on to Texas Tech. The Red Raiders were recognized by SDPIY as the league's second-best team, yet managed only a 4-4 record in Big 12 play. How so? For starters, the Red Raiders style is very conducive to gaining yards. They rarely run the ball (246 rush attempts last season--dead last in the nation) and passing gains more yards on average than running. Pretty simple stuff. But, passing is also much more inconsistent than rushing; more often resulting in negative plays such as sacks (which are actually counted as rush attempts in college), incompletions, and turnovers. Head coach Mike Leach also has a tendency to go for it on 4th down (2nd in the nation with 31 4th down attempts in 2007), enabling the Red Radiers to run more plays (9th in the nation in offensive plays per game at nearly 78 per) and thus gain more yards. Texas Tech also finished 10th in the Big 12 in turnover margin (-8 in Big 12 play) helping to explain why they only finished 7th in scoring while leading the conference in yards gained. Both high-powered offenses will be bringing back senior quarterbacks in 2008, Chase Daniel for Missouri and Graham Harrell for Texas Tech, and at least one if not both will be in New York as a Heisman finalist. The Bears may have a chance to rebound somewhat as offensive guru Art Briles moves across the state to Waco. Kansas was first in points allowed and second in yards allowed while Missouri was first in yards allowed and third in points allowed. Kansas benefitted a great deal from their schedule which we'll discuss shortly. It's not really a surprise to see Baylor at the bottom in some category, but this is quite embarrassing for the once-vaunted Husker defense. The Cyclones got the shaft in the scheduling department. Not only did they have to face Missouri and Kansas in their own division, but in their games against the Big 12 South, they drew Oklahoma, Texas, and Texas Tech. By either measure, those were the 5 best teams in the Big 12. In their games against the Big 12 South, Kansas was fortunate to avoid Oklahoma, Texas, and Texas Tech. By either SDPI measure, they played the 7 worst teams in the Big 12 (Oklahoma State, Kansas State, Texas A&M, Colorado, Nebraska, Iowa State, and Baylor). They did not play a single team in the top-5 of the Big 12 until the regular season finale against Missouri. It won't be a cake-walk, not with only 3 conference home games and the departures of running back Tony Temple and tight end Martin Rucker, but Missouri will rightly be the odds-on favorite to repeat as Big 12 North champs. As mentioned earlier, senior quarterback Chase Daniel is back to lead one of the nation's best offenses. Wide receiver Jeremy Maclin, a threat catching the ball and running it out of the backfield, should improve in his sophomore season. The defense gets 9 starters back, and although it will feel the loss of leading sacker Lorenzo Williams, it will still be very good. Plus with only 3 Big 12 home games, you have to like a road schedule that includes trips to Iowa State and Baylor, two of the league's perennial punching bags. That's right friends, the Horns, not the Sooners should be the favorites to take the Big 12 South. As mentioned earlier, the Sooners, while far from a bad team, were not the juggernaut they were made out to be in 2007. Both the Sooners and Horns suffer some significant losses on defense. Oklahoma is down 7 starters, while Texas must relace 5 gentlemen in the defensive back 7. Texas also suffered a major hit when running back Jamaal Charles decided to leave early for the NFL. Texas quarterback Colt McCoy had a down year in 2007, producing a pass efficiency rating of only 139.16 after exploding onto the scene as a freshman with a rating of 161.82. If he can cut his interceptions (22 in 2007), he should once again be one of the Big 12's stars and the Horns should be even better. Oklahoma quarterback Sam Bradford, on the other hand, is coming off an amazing freshman season where he posted an efficiency rating of 176.53. Bradford won't be bad by any stretch in 2008, but it is statistically unlikely for him to improve upon those numbers. Saying Baylor will improve does not mean I think they will be good. It just means they should notch a conference victory in 2008 after going winless in 2007. For starters, the Bears nabbed a very good coach in Art Briles. Briles is somewhat of an offensive guru, and since Baylor will likely never be able to recruit the kind of players needed to have a dominant defense, developing a unique, and fun (to entice recruits) offensive system seems to be the only way for Baylor to be competitive. Plus the Bears will probably not finish with a turnover margin as poor as they had in 2007. The Bears were -18 in turnovers in Big 12 play last year. Another team that had lousy luck in the turnover department last season was Nebraska. The Huskers were -14 in turnovers in Big 12 play last year, ahead of only Baylor. This is not to say that was the Huskers only problem. Defensively they were awful. It stands to reason though that the defense cannot be any worse, especially with the hiring of a coach with a good track-record as a defensive coordinator, Bo Pellini. Lost in the abysmal finish to 2007 (1-6 record in the last 7 games), was the improvement by the offense in the final 3 games with Joe Ganz as the quarterback. After averaging about 371 yards and 18.8 points per game over their first 5 Big 12 contests, the Huskers exploded to the tune of 599 yards and 54.3 points per game over their last 3. Of course, they lost two of them as they allowed 76 points to Kansas and 65 to Colorado, but the Huskers are a team to watch in 2008. They shouldn't be able compete for the division yet, but with 8 home games a bowl game is almost assured. And finally we have Texas Tech. The Red Raiders lose only 1 solitary starter from their run and shoot offense, wide receiver Danny Amendola. 8 of the top 10 tacklers are back on a defensive unit that only needs to be decent to give the team a chance to win big. I wouldn't be so bold as to predict a division title for Mike Leach, but a second Cotton Bowl invite in 4 years would not be out of the question. Any person who read this blog during the 2007 season knows there was not a bigger Jayhawk fan than myself. But alas, facts are facts, and the Jayhawks will not be finishing 7-1 in Big 12 play in 2008. For starters, Kansas was 3-1 in one-score games in Big 12 play last season, so they may see some regression in that department. Secondly, Kansas led the Big 12 in turnover margin in conference play. They were +15 in 8 conference games, meaning they gained nearly two more turnovers per game on average than their opponents. That extreme good fortune will not continue. Finally, their decline will be a matter of scheduling. Last season, Kansas was fortunate to play the 3 weakest teams from the Big 12 South. In 2008, they must play the 3 strongest teams from that division. Texas, Oklahoma, and Texas Tech replace Baylor, Oklahoma State, and Texas A&M. Kansas returns a great deal of talent, and Mangino is a fine coach, so I don't expect them to fall out of the bowl picture. Their season will probably look a lot like Rutgers in 2007. Kansas will probably finish 8-4 or 7-5 in the regular season and be bowl-eligible for the 4th season in a row. Much like Rutgers 8-5 season, it will be seen as somewhat of a disappointment, but considering where the program was just a few years ago, it will in fact be a solid accomplishment. One of my favorite set of posts from last offseason was the conference recap using SDPI. SDPI is a statistic I borrowed from Eddie Epstein that he used in his book, Dominance, to rank pro football's all-time greatest teams. SDPI stands for Standard Deviation Power Index and looks at how teams performed relative to the league average (or conference average in this case) and standard deviation in terms of points scored and allowed. The more standard deviations a team is above the mean, the better they are, and vice-versa. Here is the link to last year's Big 10 post. As you can see, SDPI was a useful tool in predicting some of the rise and fall among the Big 10's teams. In the interest of providing an even better offseason analysis, I will now be conducting another SDPI, this time for yardage. It is calculated in the same manner as the SDPI for points, but will obviously be measured against the conference mean and standard deviation for yards. Think of it this way: Points are the end result and yards are the means to that end. Thus, looking at both sets of data, we can get an even better idea about which teams are likely to improve or regress in 2008. If you want the meat of the article, skip this next paragraph as it just gives an example of how the SDPI is calculated. The mean points scored and allowed for all Big 10 teams in conference play was 210.55 points. The standard deviation for points scored was 34.45. The standard deviation for points allowed was 64.99. Purdue scored 213 points in Big 10 play and allowed 226. Their offensive SDPI was 0.07 = ([213-210.55]/34.45). Their defensive SDPI was -0.24 = ([210.55-226]/64.99). Their total SDPI for points (SDPIP) was -0.17 which ranked 7th in the conference. The mean yardage for and against for all Big 10 teams in conference play was 3055.64 yards. The standard deviation for yardage for was 294.16. The standard deviation for yards allowed was 528.69. Purdue gained 3100 yards in conference play and allowed 3171. Their offensive SDPI was 0.15 = ([3100-3055.64]/294.16). Their defensive SDPI was -0.22 = ([3055.64-3171]/528.69). Their total SDPI for yards (SDPIY) was -0.07 which ranked 8th in the conference. 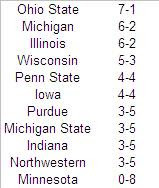 To refresh your memory, here are the 2007 Big 10 Standing. Two teams stand out when looking at the SDPI rankings versus the actual standings. Iowa, which finished tied for 5th with Penn State with a 4-4 conference record, actually rates as the worst team in the Big 10 in terms of yardage (even worse than winless Minnesota!) and second to last if we look at points scored and allowed. We'll get to the Hawkeyes offensive futility in a bit, but for now we'll try to answer the question of how Iowa was able to win 4 conference games, while Minnesota was not able to bag a single victory. For starters, whether it be clutch play or blind chance, Iowa won close games. They were involved in 4 one-score games in Big 10 play. They won 3 of them (one of which was against Minnesota). The Gophers on the other hand, were involved in 3 one-score games in Big 10 play, and lost all 3. Iowa was also very fortunate in regards to turnover margin in Big 10 play. They gained 9 more turnovers than they lost in conference play (best in the Big 10), while Minnesota had a margin of -6 (second to last). Finally, for all their offensive struggles, Iowa was much stronger than Minnesota defensively. The Gophers allowed the most yards in conference play, and the second most points, while Iowa was 5th in both yards allowed and points allowed. Preliminary research has shown that defense has a bigger impact in a team's won/loss record than offense. The second team that stands out is Michigan State. The Spartans finished tied for 7th in the Big 10 with Indiana, Purdue, and Northwestern, but were statistically the second best team in the conference. All 5 of the Spartans' conference losses, and their loss in the bowl game to Boston College, were by 7 points or fewer. With a few breaks, they could have very easily been the conferences' sacrificial lamb in Pasadena. The Spartans gained the most yards and scored the most points in Big 10 play. They were shutdown against Ohio State, gaining only 185 yards, but they amassed over 400 yards in 6 of 8 conference games. This is not even close. The second worst team at scoring points, Minnesota, managed to score 44 more points than the Hawkeyes. That is less than the difference between the 3rd highest scoring team (Illinois) and Minnesota (38 points difference). In terms of yardage, the 2nd worst prolific team was !gasp! Michigan. However, the Wolverines gained about 53 more yards per game than the Hawkeyes. That is less than the difference between the team that gained the most yardage (Michigan State) and the team that finished 8th in yards (Penn State). The Spartans gained only about 45 yards more per game than the Nittany Lions. The Buckeyes nearly lapped the field in both categories. The second best defense by both metrics (Michigan) allowed about 85 more yards per game and 5.6 more points per game than Tressel's Troops. Northwestern allowed the most points and the second most yards, while Minnesota allowed the most yards and the second most points. Either way, these two schools are bringing up the rear. This is really splitting hairs. While both played one of the bottom two teams in the conference (Penn State played Iowa and Michigan played Minnesota), they also played nearly every team in the top half of the league (Illinois, Wisconsin, Michigan State, Ohio State and each other). Indiana played both Iowa and Minnesota while avoiding Ohio State. Illinois did play the wheat of the conference (Ohio State, Wisconsin, Penn State, and Michigan), but they also drew a sizeable portion of the chaff (Iowa, Minnesota, Northwestern, and Indiana). Some team may rise up and shock us all, but heading into next season the smart money is on the Buckeyes. Look who's coming back. Quarterback. Check. Running back. Check. Starting receivers and tight ends. Check. Majority of offensive linemen. Check. 9 of the top 10 tacklers from a fantastic defense. Check. Plus look at the teams that finshed closest to them in the standings. Illinois loses a game-changing running back, and were a bit fortunate to finish where they did in the standings in the first place. Michigan loses their starting quarterback and running back and must learn new schemes on offense. Wisconsin and Penn State both lose their starting quarterbacks. And the team closest to them in terms of SDPI? The Spartans do bring back some very good offensive talent, but they lose 6 of their top 10 tacklers. Plus the Buckeyes get Penn State and Michigan in Columbus. They do have to go on the road to take on the Illini, Spartans, and Badgers, but even if they drop 2 of those, they can still take home the league title. As discussed, probably ad nauseum earlier, the Spartans were extremely unlucky in 2007, and yet still finished bowl eligible. Despite starting a relatively inexperienced junior quarterback, and breaking in a new head coach, the Spartans had the best offense in the Big 10. In 2008, the quarterback (Brian Hoyer), starting running back (Javon Ringer), and leading receiver (Devin Thomas) all return. The Spartans do lose Ringer's backfield mate and second leading rusher, Jehuu Caulcrick, as well as star tight end Kellen Davis, but the pieces are in place to have another top notch offense. The defense does lose 6 of its top 10 tacklers, including both defensive ends, Jonal Saint-Dic and Ervin Baldwin (combined 18.5 sacks), but even if the Spartans don't improve at all performance-wise, some progression to the mean in the luck department will equate to a better record. And if everything goes right, well Michigan State could win the conference title. Picking Minnesota to improve is a lot like picking the sun to rise. It's hard to get any worse than 0-8 in the conference. With their relatively soft non-conference schedule (Northern Illinois, Montana State, and Florida Atlantic come to the Metrodome, while the Gophers travel to Bowling Green), they have a real shot at being 4-0 before conference play starts. Thus, two wins would get them to bowl-eligibility. The Gophers have 3 very winnable home games against Iowa, Northwestern, and Indiana in conference play, so don't discount the chances of a bowl invite following a one-win season. The Gophers also have a few positive trends. They were second to last in the Big 10 in turnover margin (-6) and quarterback Adam Weber will be in his second season as a starter. Weber played reasonably well for a freshman throwing 24 TDs and 19 interceptions, while running for over 600 yards. But the Gophers success or failure next season will be based on their performance on the other side of the ball. The defense must improve on the nearly 500 yards and 38 points per game they allowed in conference play. Finally, we have the Northwestern Wildcats. Year 3 of the Pat Fitzgerald era should end with a bowl invite. The Wildcats did finish 3-0 in one-score conferece games in 2007, but they also finished last in the conference with a turnover margin of -12 in Big 10 play. Quarterback CJ Bacher and running back Tyrell Sutton both return for their senior campaigns. 3 of their top 4 receivers are also back. The defense does lose 3 of its top 4 tacklers, but also brings back 8 of its top 11. Still, the Wildcats turnover margin cannot be as bad as it was in 2007 and with Duke, Syracuse, Ohio, and Southern Illinois on the non-conference schedule, a good start is almost a given. I will say this for the Hawkeyes, despite their offensive ineptitude, they at least managed to not further soil their season by limiting their turnovers. In 8 conference games, they turned the ball over only 7 times (best in the Big 10). The main issue for the Hawkeyes was their inability to protect quarterback Jake Christensen. Including non-conference games against Northern Illinois, Syracuse, Iowa State, and Western Michigan, the offensive line allowed 46 sacks (115th in the nation in sacks allowed per game). All 5 starters do return and Christensen is back under center, but running backs Albert Young and Damian Sims are gone. And the offense simply has a long way to go to even be 'bad'. The Hawkeyes will certainly not be as fortunate in the turnover department, so don't expect them to win more than 3 conference games. After an unexpected bowl bid, the Hoosiers appear to be on the rise. Not so fast. Despite the presence of Kellen Lewis under center and the 6-7 James Hardy boxing out defenders down field, the Hoosiers still finished 9th in the Big 10 in yards per game. The offense showed flashes, but altogether was not good. Now Hardy is gone a year early to the NFL and Lewis will be forced to shoulder more of the load. As for the defense? It's been terrible for sometime. The Hoosiers did sack opposing quarterbacks 42 times (6th in the nation in sacks per game), but only two teams (Northwestern and Minnesota) allowed more yards in Big 10 play. Now the best defenders in the back 7, Tracy Porter and Leslie Majors, are gone. If the Hoosiers improve defensively, it won't be by much. The scedule is bereft of both Michigan and Ohio State, and the 4 non-conference games are all home contests against mid-major teams (Ball State, Central Michigan, Murray State, and Western Kentucky), but don't look for a second consecutive bowl bid for the Hoosiers. I usually don't hawk other websites here; you can find several of the sites I visit daily on the right, but I feel I owe a debt of gratitude to CFB Stats dot com. That smorgasboard of statistics is where I get all my information to do my research. Even if you are not a stat geek and just want to know who led the nation in quarterback rating in 2005, give it a look. In other football news, the Giants pulled off one of the most shocking upsets in Super Bowl history. While the point spread wasn't the largest ever, I think you'd be hard-pressed to come up with a game that went as far against what everyone thought was going to happen. Congrats Giants. Congrats on defeating a team I rue more than any other in professional sports. Their smug coach, insuffereable fans, and arrogant quarterback can go away to lick their wounds for a few months. And congrats Art Monk. Finally, the Hall called. I'm still holding out hope for this guy.